In our Virtual Franchise Events are our most important tool. Learn to introduce Juice Plus+ to your friends and family, you will make excellent part-time income. Learn to sponsor and train a nucleus of committed people, you will make a better than average living. Learn how to promote events and teach others to do the same, and you will make a small Fortune. Preferred Customers are the “life-blood” of your business, and Events are the “arteries” of your business. Your attitude will make the difference between success and failure, so make a commitment to an upcoming event. Make it non-negotiable: that you will be there and that you will have guests. If you are to enthusiastically promote and invite your customers to events, you must love them yourself. You must attend lots of events. The more events you attend WITH guests, the more successful you will be and the more you will love what you do – and it will show. “Promoting” is more than describing. We don’t sell Juice Plus +, but we must “Sell” the event, and more importantly the speaker. Listen to this excellent message by Dana Wright (SSC) on Inviting. The invitation process (‘promotion’) can be summarized in four words: “Promote, Call, Send, Call”. Use the event flyer; decide what you will enthusiastically tell your guests: why they mustn’t miss this opportunity. It’s very similar to “selling” the Video – tell them just enough (don’t ‘fire-hose’ them! ), with passion and sincerity that they will want to be there. Decide who you will personally invite: your top 20-30. The invitation can be made in person or by phone. Email is NOT the way to invite someone you really want to be there; although it’s ok to email those in your Pipeline who you invite to every event. When they say “yes” then follow up with an email, text, facebook, giving details of the event, using the flyer. A day or two before the event call them: “I’m just confirming that you received the details of our seminar on Friday, and that I can count on you being there.” You are letting them know it’s important, and that they can’t back-out. THIS EVENT COULD CHANGE THEIR LIFE….AND GIVE THEM HOPE! It may be the spark that puts them on the path to prevention, not only for themselves, but for their whole family. 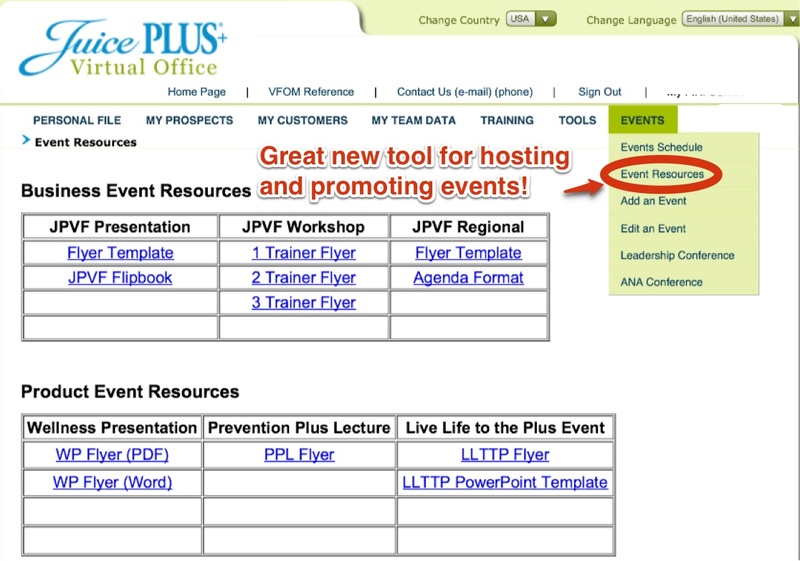 Your Virtual Office has a listing all the events around the country – VF Training events as well as Prevention Plus+. www.juiceplusevents.com – gives you all the info. about upcoming Prevention Plus+ events, and it allows you to send a customer or prospect across the country to a Prevention Plus+ event, while impressing them with our technology support. Try it – you’ll like it! If you don’t have events in your area, or not enough, don’t “wish” there were, go ahead and create one yourself. Wellness Presentations are great. These are usually held in the home, but they can also take place in restaurants (private room), offices, club houses, doctor’s offices, etc. Combining forces with another Rep can bring more people out. The local police station or fire station may have a Community Room they will let you use free. A local health care professional may be willing to speak on their specialty, with you following them talking about Juice Plus+. It is always better if they are taking Juice Plus+ and believe in it first.